On Monday night we checked out Vite Vinosteria on its first day open to the public—this is the new Italian wine bar that has opened up in the old Bugatti space on 34th Street near 31st Avenue. This is an amazing food intersection in Astoria, full of high-caliber restaurants and bars, and we think Vite more than fits in. 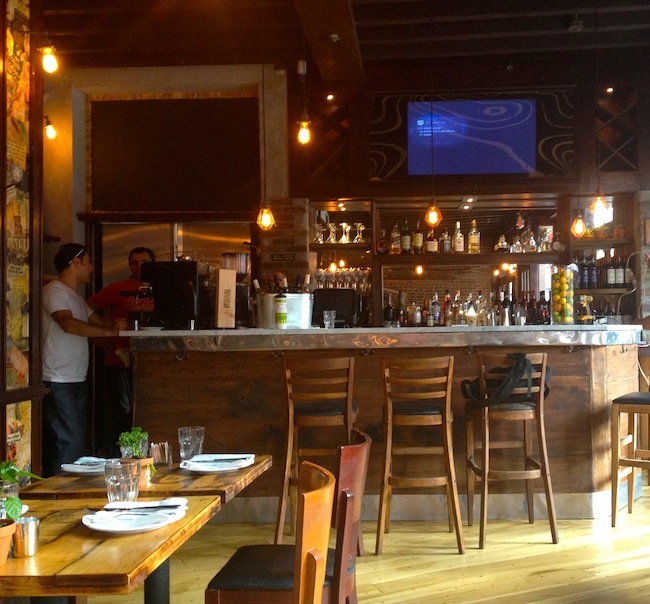 It’s a nice, relaxed space that serves some seriously delicious food and drink. We were the first ones there and had our pick of seats. We ended up sitting in the main dining room. There’s also a raised area in the north part of the dining room. 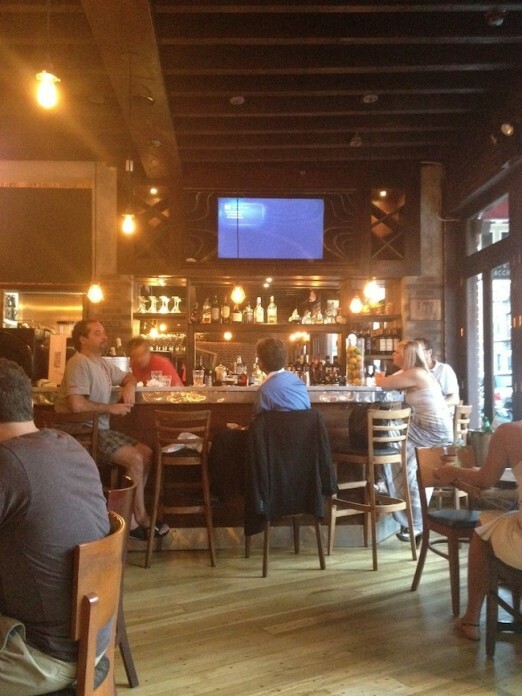 On the opposite end is a bar. We were served a glass of Grüner Veltliner, a crisp white wine that was perfect for the warm, humid evening. The producer is Paul D. So delicious. 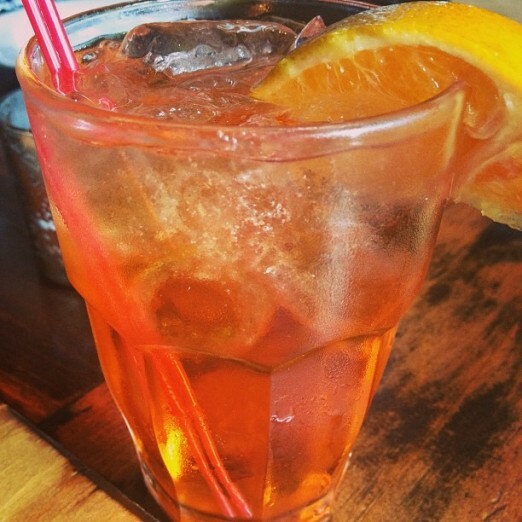 Later on I opted for an Aperol Spritz, AKA summer in a glass. It was wonderful! Just a tad bitter, very smooth, with a nice addition of orange. 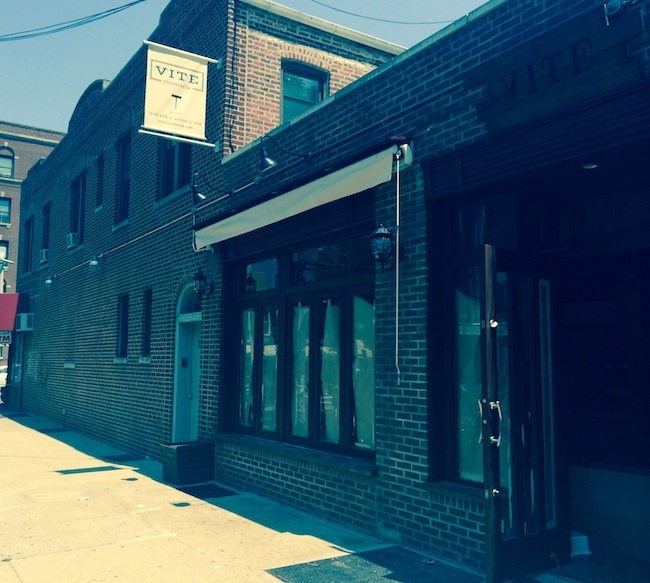 This means that Vite has a full liquor license. 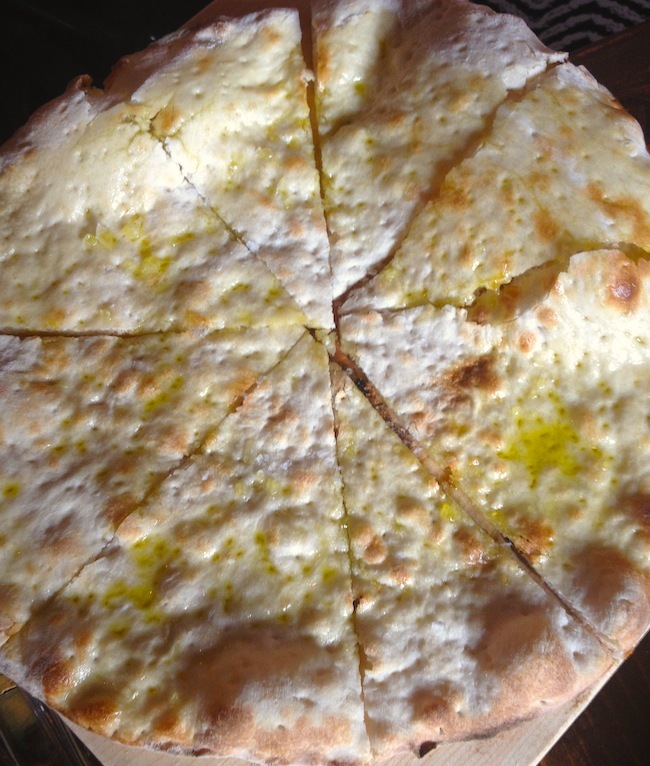 We had this thin, round bread they called foccaccia, very simple with fruity olive oil and some salt on it. And although that sounds simple and basic, it was delicious, the sum being more than its part. We loved the texture. I especially liked the salt, adding a sharpness to the grain and fat. 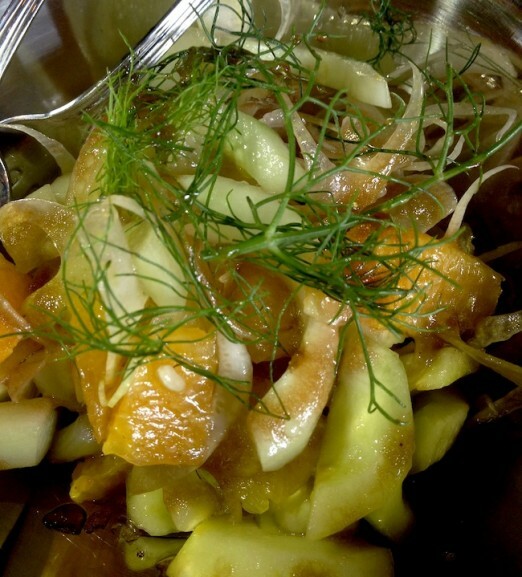 Along with that we ordered this lovely salad made of cucumber, fennel, orange supremes, and dill, dressed with a simple olive oil-balsamic vinaigrette. This may very well have been one of our favorite dishes of the night. One of the owners, Pino, said it was his favorite salad on the menu. 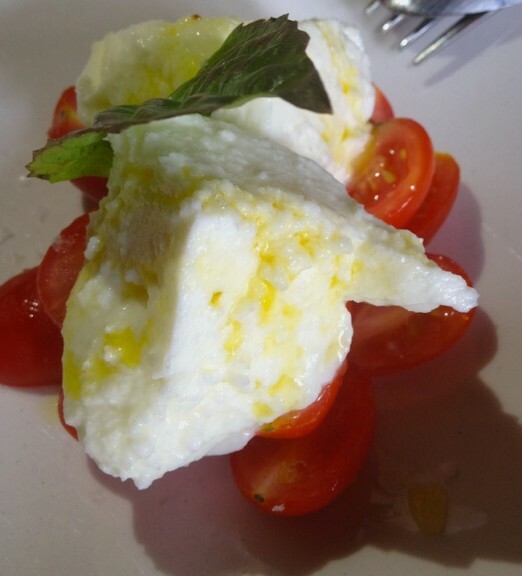 We also tried their Caprese Salad, made with a fresh mozzarella imported from Italy, and grape tomatoes. 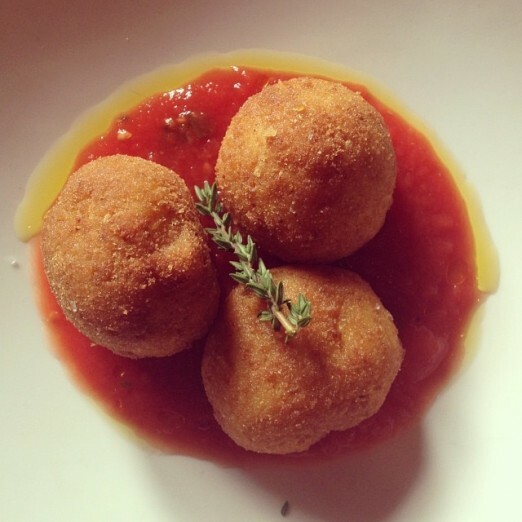 We saw the arancini on the menu and couldn’t resist ordering them. Who can say no to fried rice balls? Not us. These were lovely—small, delicate yet firm, and not greasy at all. They arrived sitting in a pool of a light tomato sauce. I loved the bright yellow color of the insides. 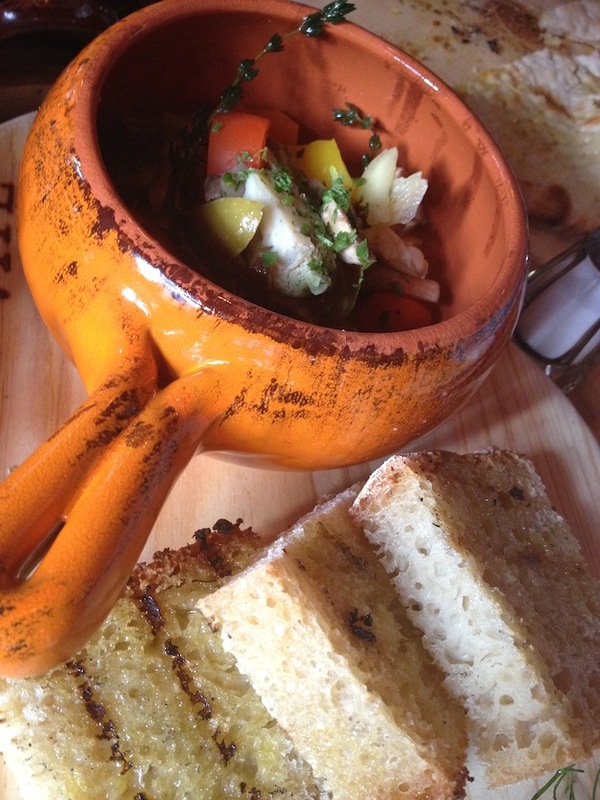 Another dish that caught our eyes is the Bornie Di Sott’olii, which is a dish of lightly pickled vegetables with olive oil, served with toasted foccaccia (this time it was a thicker bread). This was another hit, and one of us even ate the pickled garlic clove (good for the blood). On the non-vegetarian side we chose a dish of fried calamari, which was quite nice. 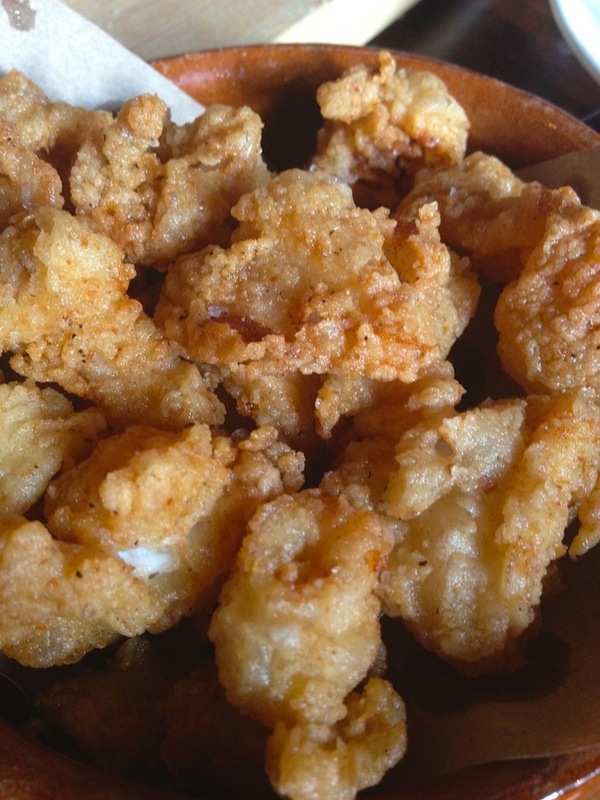 I am not a calamari fan but I liked how tender these little nuggets were. Our calamari-friendly contingent really liked them, too. We wanted dessert and found many tempting options on the menu. 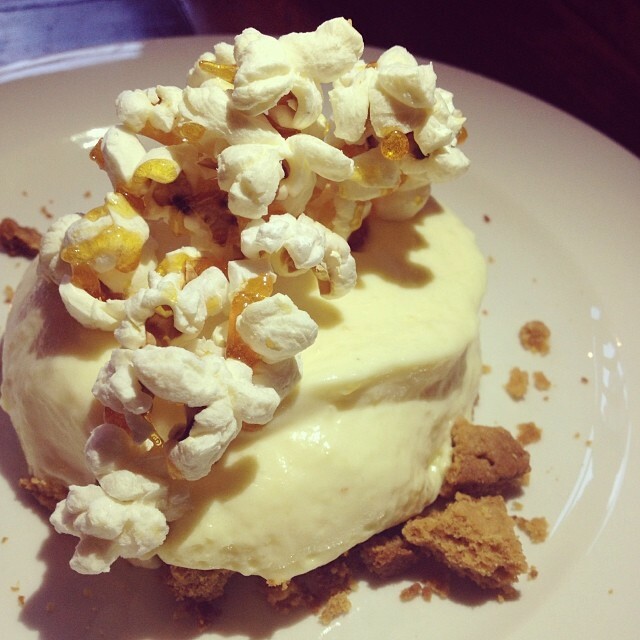 We opted for the popcorn mousse and the pear tarte tatin with chocolate. Both were excellent. The light texture of the mousse was amazing, along with the flavor of popcorn, and the pear tarte tatin was a wonderful combination of fruit, caramel, and chocolate. By the time our meal was over, the place was quite busy! Overall, we were impressed and look forward to our next meal there. 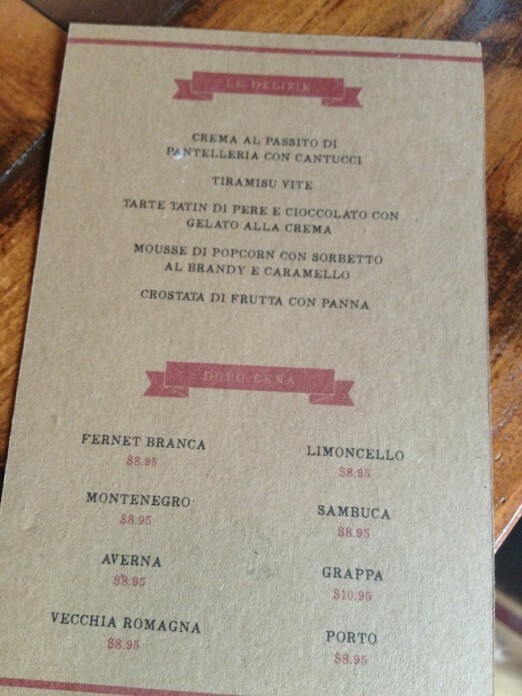 Welcome to the neighborhood, Vite Vinosteria! 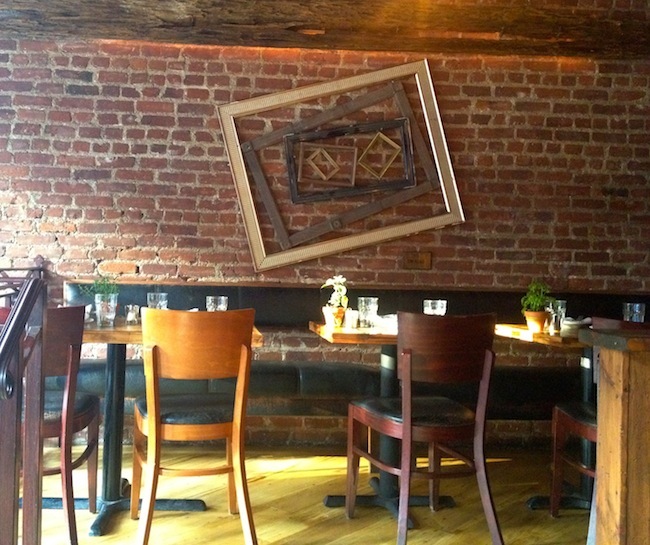 We ate dinner here last night and the food is excellent, as is the service. They have been open a total of three days now, so there are some things they need to iron out still (credit cards not accepted, that should be any day now), but once all the usual restaurant services are up and running it’s sure to be a success. The TV was actually the source of music, which was quite nice that evening. They plan to use it to show Italian sports matches and perhaps other Italian broadcasts. It was completely unobtrusive to us when we were there, but of course, to each their own. Its not dessert if there is no dark chocolate on the menu! 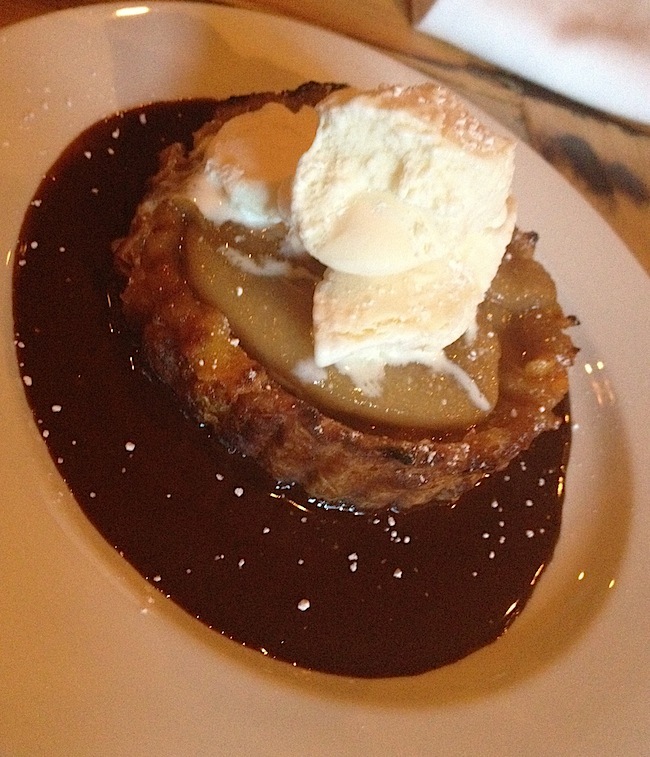 sorry..
Ah, but the pear tarte tatin was placed in a pool of dark chocolate sauce. It was divine! 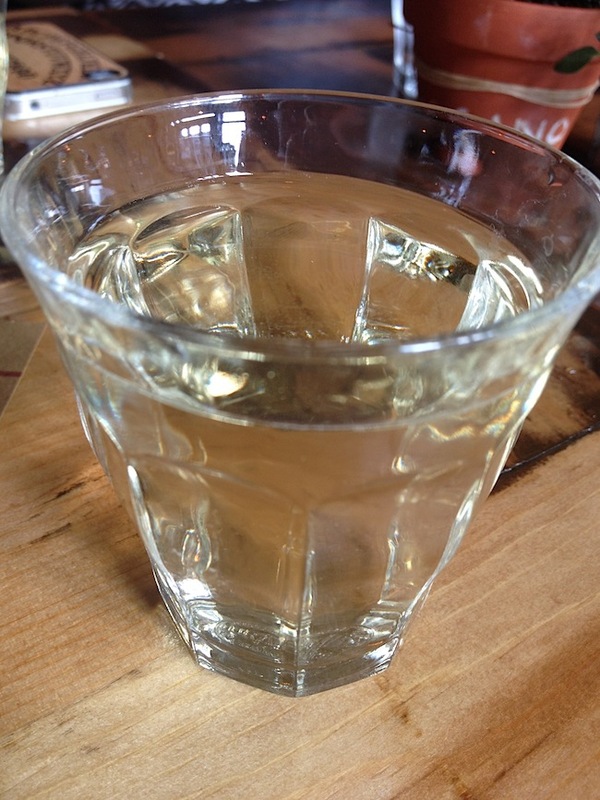 Maybe it’s the angle of the photo, but that looks like a pretty thick/hefty glass for white wine. It was definitely not a conventional wine glass, but it worked very well.